Uff Da is a Norwegian expression usually used when surprised or in dismay. This mug featuring "Uff da!" in red is the perfect mug for your coffee or hot chocolate. 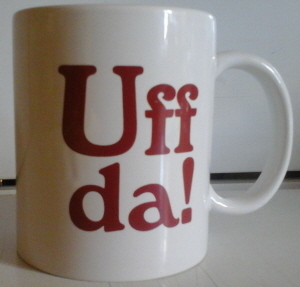 This Uff Da Mug is 3.5 in. tall by 3 in. wide with a 1.25 in. wide handle.